The New York City Department of Transportation is to pilot test PayByPhone‘s mobile payments system, which is already live in San Francisco, Miami, London and Vancouver, in an 18 block area of the Belmont Business Improvement District in the Bronx. Users register their license plate number and credit card details on the PayByPhone website before downloading the PayByPhone app. Motorists can then either scan a QR code or tap their phone to an NFC tag attached to Muni-Meter parking meters to pay for parking in fifteen minute periods. A reminder is then sent via text message or email to the driver’s phone before the parking period expires, allowing users to buy additional time via their smartphone from any location. Receipts are also sent to the user’s email account. Motorists can also pay by phone using a unique number displayed on each Muni-Meter. The new mobile parking payments service is being launched alongside a second pilot that will test out a real-time parking availability system. This will use sensors embedded alongside roads to create an online map that highlights areas where there are likely to be empty parking spaces. 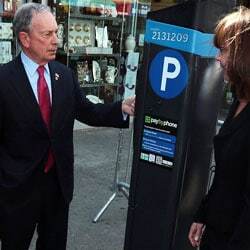 “These new initiatives are just the latest examples of our work to bring parking and driving in New York City into the 21st century,” said New York City mayor Michael Bloomberg.